Kid Ramos has something old that, for many blues music fans, might be something new. On April 15th, Rip Cat Records is going to re-issue the long out of print album, Two Hands One Heart. 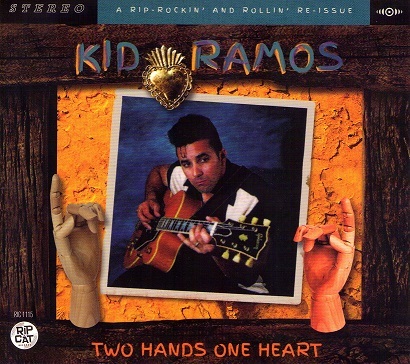 This 1995 album was Ramos’ solo debut. It was originally released on Black Magic Records out of the Netherlands. They sold the product to New Orleans based Black Top Records who subsequently went belly up. Years ago Ramos told me he never saw a dime from the sales of that record. Good things however come to good people and those who wait. Rip Cat Records’ owner Scott Abeyta told me recently that 100% of the proceeds from the sale of this digitally re-mastered CD will go to Ramos. As most of our readers are aware, Ramos is in remission from a rare form of cancer called soft cell Sarcoma. His nearly two year battle with the disease, by all indications, has come to an end, but his inability to work over these many months, combined with staggering medical costs have taken their toll. With this in mind, Abeyta’s timely re-issue of this material is very welcome for a couple of reasons. The second of course is the chance to listen to some absolutely outstanding music. Guest vocalist Janiva Magness sings on three songs, but it is Ramos’ old buddy Lynwood Slim who steps up to the mic to sing on ten of this record’s original sixteen track release. This re-issue also has three new never before released alternate takes which feature the wonderful vocals of the one and only Lynwood Slim. The core band on Two Hands One Heart is comprised of pianist Fred Kaplan, drummer Richard Innes and Tyler Pederson on bass. The horn section is made up of the late Spyder Middleton on tenor and baritone sax. He is joined by fellow sax man Johnny Viau and trumpeter Scott Steen. The other special guests include the recently departed John “Juke” Logan, as well as Johnny Bazz on bass. The album is imbued with a variety of blues styles with a big helping of swinging, west coast, T-Bone Walker inspired music thrown liberally into the mix. It is material like this that Kid was seemingly born to play and Slim was born to sing. In remastering and remixing the album, Scott Abeyta was able to coax a much warmer, richer sound out of this material. The voice of Lynwood Slim, which originally had too much compression, now sounds exactly like what you would hear if you were standing next to him in a room. The improvement in sound when playing both releases back to back is nothing short of extraordinary. Leaving space around each individual instrument makes for a very organic blues sound with all the dynamics music of this caliber deserves. This record has been a personal favorite of mine for nearly twenty years. In short, Two Hands One Heart is one of the great blues releases of the last generation and it just got better. For those who missed out on this gem the first couple times around, the third time is a charm. For those who think they have heard this album, you may want to check out something old that sounds completely new.